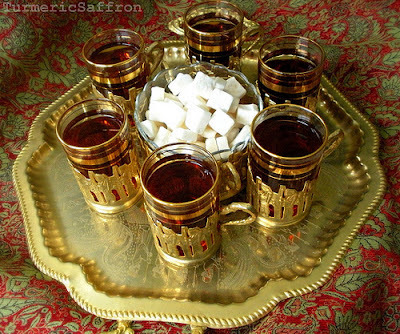 When you walk into an Iranian home after the customary greetings, the first thing you would be offered as soon as you sit down is a well brewed hot cup of چای chai (tea). Tea is the hot beverage of choice in Iran where it is served for breakfast, lunch, dinner and in between with at least one or more refills. There's more to drinking tea than meets the eye. It's about being together with family and friends, relaxing and talking. However, when alone nothing is better than drinking tea and reading a good book. 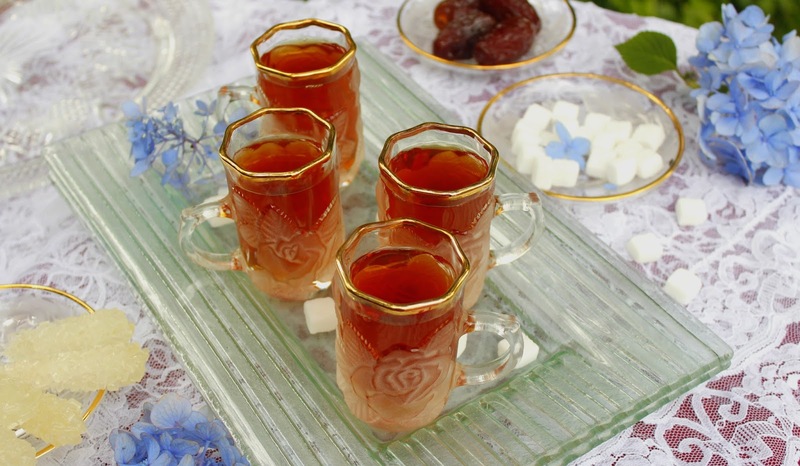 The history of tea dates back to the late 15th century. Before that coffee was the main hot drink in our country. 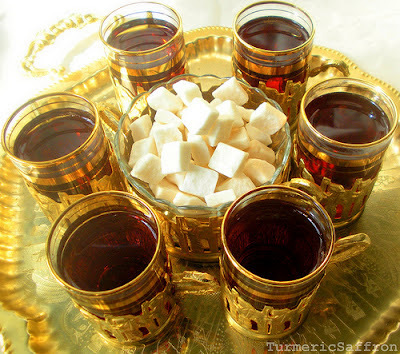 Coffee houses (ghahveh khaneh) were built on the side of roads, as resting places for travelers. They would be served some food and a chance to take a break for awhile before heading out to their destinations. 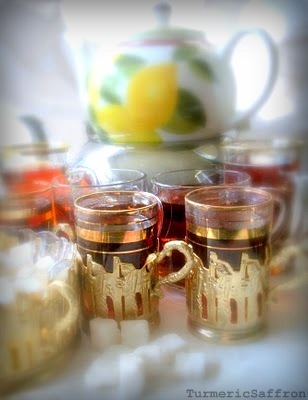 The name "coffee house" (ghahveh khaneh) still remains to date even though they mainly serve tea. To brew a perfect Persian style tea, you need a good quality long, loose leaf black tea.Using a porcelain or china teapot is recommended. The teapot should have several tiny holes inside where the spout is located which works as a strainer. Also, you need a kettle not only to boil the water but to serve as a stand for the teapot while the tea is brewing on the stove. Using an electrical samavar, if you happen to have one, is the best option. 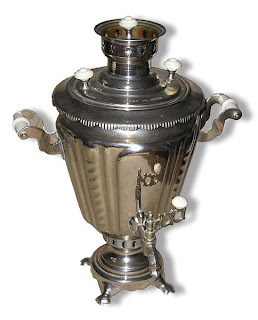 Samavar was brought to Iran in the 18th century from Russia. Fill the kettle with fresh cold water and bring to a boil. As soon as the water comes to a boil, warm up your teapot by rinsing it with some hot water from the kettle. Place 2 tablespoons of tea into the teapot. Don't use any tea holders inside the teapot. If you buy your tea in bulks from outdoor vendors, you may want to also give your tea a gentle rinse with water to get rid of the possible dirt and dust. Pour water into the pot over the loose tea leaves. Fill it nearly to the rim and put the lid back on. Place the pot on the kettle in a secure position. It should fit well on the kettle. Allow it to brew for at least 10-15 minutes on medium to low heat. Rinse inside the cups with hot water. Gently pour tea into glass cups to prevent it from making a lot of bubbles. Depending on how strong or light you might like your tea, adjust it using the boiled water in the kettle. It is a good practice when serving a large group of guests to have a tray with both light and dark tea. You may serve chai with sugar cubes, dates, raisins or other sweets. However, for those serious tea drinkers, adding sugar, milk or anything else would take away from the taste. There's also the etiquette of serving the eldest and the ladies first as you are making rounds. Make sure there are no spillage on the tray either. That's the lesson I learned early on in my life when I was only ten years old. One day, my mother handed me a tray with several full cups and told me to take it outside and offer them to the guests sitting in the garden. Before I could get any further some tea spilled due to my shaky hands. She wiped the tray, filled up the cups and told me: "Look, you should be able to dance ballet and carry a tea tray at the same time without spilling a drop." The memory of that day is still fresh in my mind! I like my tea dark and a little bit on the bitter side with no sugar, milk or lemon. How do you like your tea? 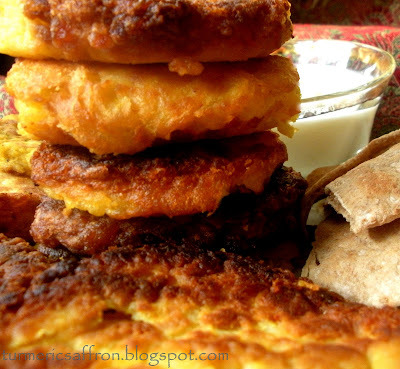 This dish consists of fried potatoes and eggs, blended with some sugar and saffron. Usually, I like having my meals and sweets separate and each in its own place. However, there are those sweet but occasional dishes such as the sweet rice, beet and yogurt dip and kookoo ghandi that I like to cook once in a while or for special occasions. However, in general we Iranians like our food more on the sour side, adding dried lemons or lemon juice to our soups and stews and most of the time serve pickled vegetables (torshi) with our meals. Potato was brought to Iran and its neighboring countries in the late 19th century by a foreign diplomat. The Persian/Farsi name for potato is "Sib-Zamini" sib means apple and zamin means the ground/earth.Therefore the name sib-zamini literally means "ground apple" in our language. Potato is widely used in cooking, it adds flavor and texture to the food but in this case it is a dish in and of itself. 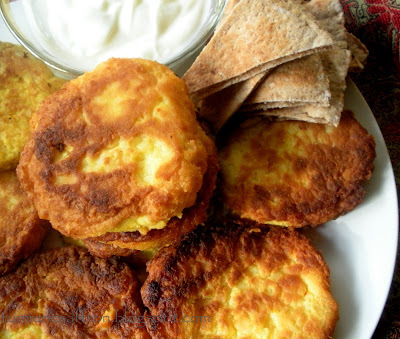 For the regular Persian Potato Patties (kookoo Sib-Zamini), see the recipe here. Wash, scrub and rinse potatoes. Place potatoes in a large pot and pour enough water to cover them plus an extra inch of water. Cook for about 30-40 minutes until the center of the potatoes are well cooked. When an inserted knife comes out clean, drain and set aside to cool. Peel and grind potatoes, add salt, eggs, liquid saffron and sugar. Mix thoroughly. Set aside for 20 minutes before frying. In a non-stick frying pan heat some oil. When oil is hot take a small scoop of the batter and make it into a round or oval shape, flatten and gently place in hot oil. Fry on both sides. 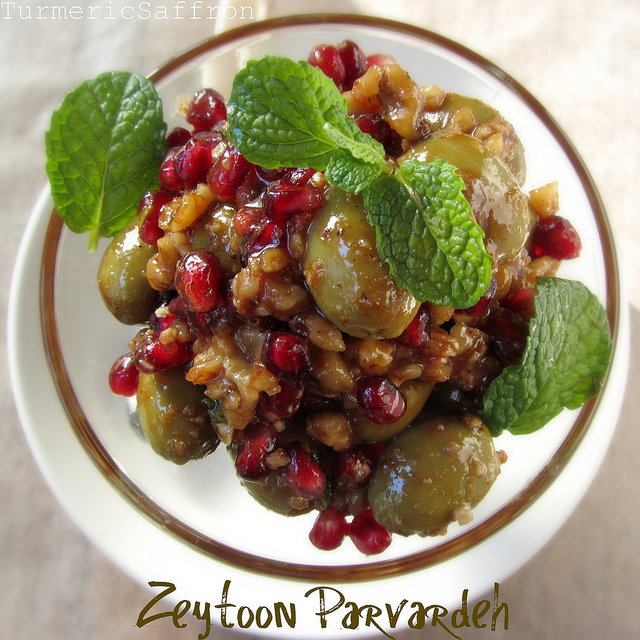 Serve warm with plain yogurt, sabzi khordan and bread. 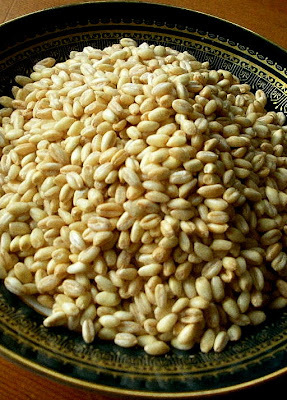 Barley is an ancient grain with an obscure origin. 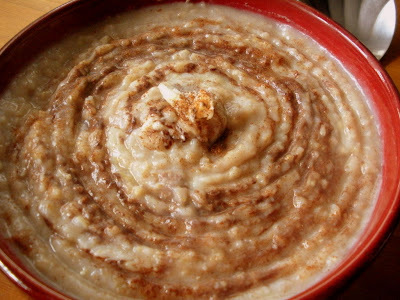 However, as old as barley is, it has never gotten to be a popular grain for cooking in our culture. In the land where wheat bread (taftoon, lavash, barbary and sangag) is the staple of Iranian food, barley has never had a chance to compete for first place. Barley may be nutritious, versatile, and economical to buy but the only recipes that I know of which use barley as a main ingredient are the barley soup(soup-e jo) and the barley stew (ash-e jo). I'll ask, "What's with this?" and "What's with that?" To another only a loaf of barley bread soaked in blood. 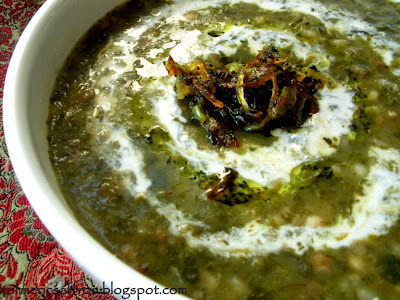 آش جو - Ash-e jo is a thick soup made of barley, lentils, chickpeas, and beans (white beans or small red kidney beans). The vegetables that are usually used in this soup are parsley, leeks, and cilantro. I like to add some dill and spinach as well. Some people might like to add some meat to the stew too but I think this soup tastes much better without any added meat. I use the following proportion to cook for my family of four and I usually have some left-overs that I freeze for later use. However, if you rather cook fresh on a daily basis or you are cooking for one or two people, then cut the amount of the ingredients in half. 1/2 cup beans (white beans or red kidney beans) soaked overnight, I used white beans. In a large stew pot, place barley, chickpeas, beans, lentils and add 6 cups of water. Bring to a boil on medium-high heat, then reduce the heat to medium-low and cook for 1 1/2 hours or until beans are tender, stirring occasionally. Add the chopped vegetables, salt, and pepper. Add more water if necessary. Cook for another 30 minutes on low heat. Taste and adjust the seasoning. In the meantime, in a small pan heat 3 tablespoons oil over medium high heat, saute onions until golden brown. add turmeric and stir well. Add dried mint and remove from heat. Set aside. 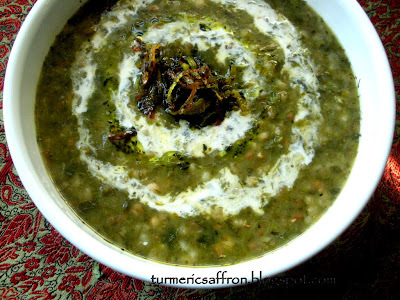 To serve, pour soup in a serving bowl, drizzle some kashk and top with the fried onions and mint mixture. 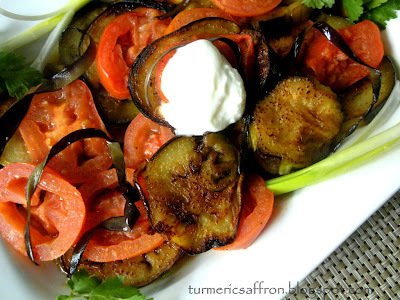 Serve with warm bread. This unplanned post was brought about due to a reader's question regarding tah-dig. She asks: "Is there something I can do to get a better crust?" Great question! 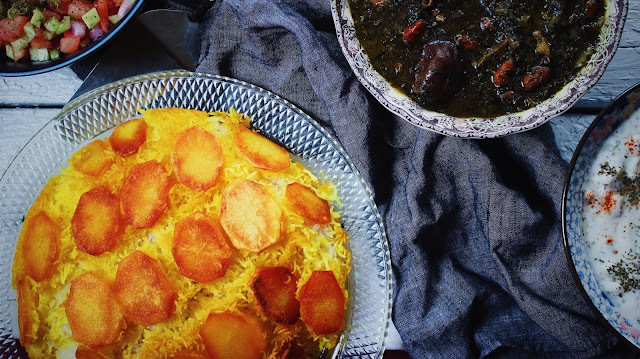 I've been blogging about Iranian food for months now but it didn't occur to me to write about tah-dig, the tastiest and most sought after part of a rice dish. If only tah-dig could speak it would probably be saying "I get no respect!." I feel I've neglected a precious and very important part of the Persian cuisine. I write it as 'tah-dig.' You may write 'tahdig'/'tahdeeg', however, it's pronounced tadeeg. "Tah" means bottom and "dig" means pot in Persian/Farsi language. 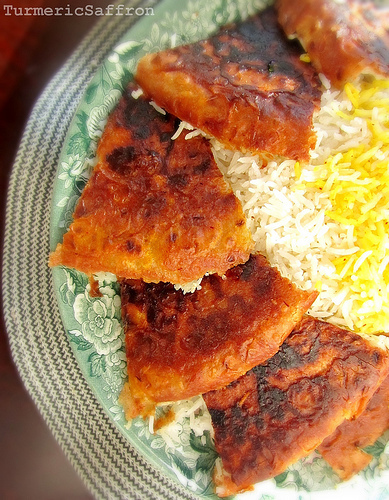 ته دیگ Tahdig refers to the crunchy and crispy bottom layer of rice cooked in a pot. The formation of tahdig is a perfect symphony between the right temperature, the amount of oil, aromatic rice, length of time, right kind of pan, some experience and a little patience. 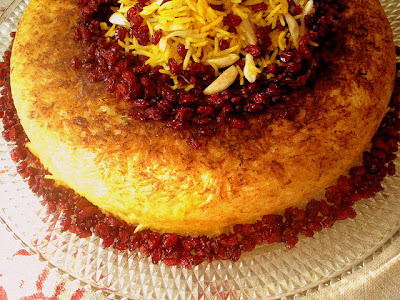 If you don't achieve the best kind of tahdig the first time, don't worry. 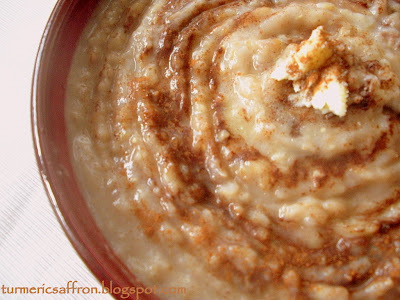 There's always the next rice dish you can experiment with. 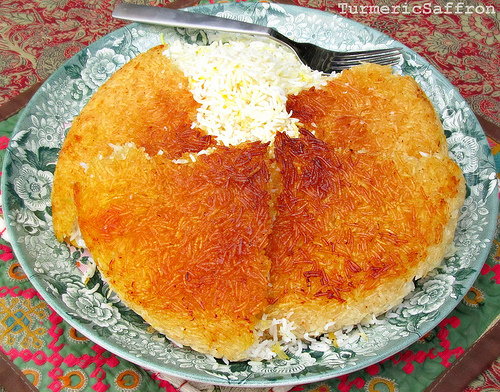 Since rice is a staple of Iranian cooking that's how we have eventually been able to conquer the art of making tahdig. As the old adage goes: "practice makes perfect!" And if this is any consolation, let me tell you that even experienced cooks falter sometimes. 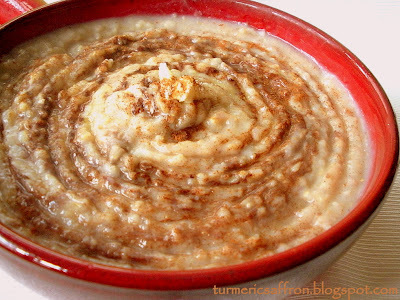 There are many kinds of tahdig. 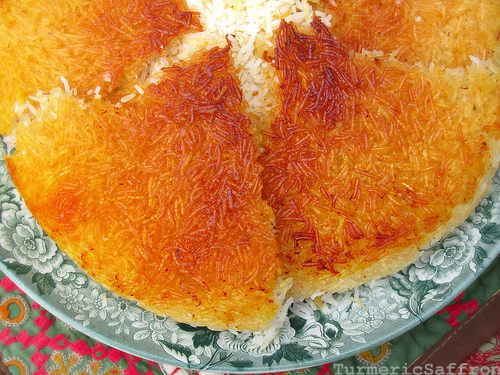 The most well known is the rice tahdig. 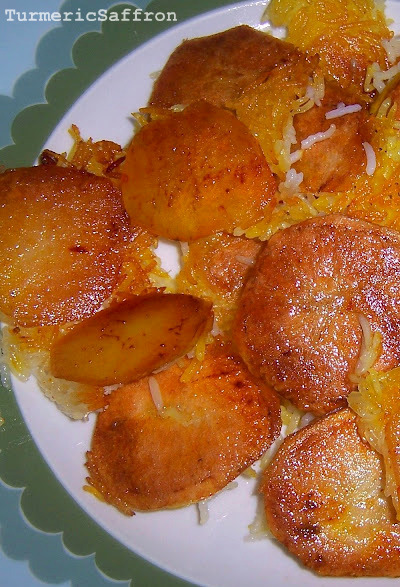 There's also potato tahdig (my favorite) which goes well with rice and chicken dishes. If you choose to layer the bottom of the pan with potato slices, cut them evenly and not too thin. Add a dash of salt after layering them, wait for a few minutes till they are a little bit fried then turn them over and pour the rice over the potatoes and follow the same steps as the rice tahdig recipe. There's also the bread tahdig. Any kind of flat bread could be used such as lavash or pita. I've had lettuce ta-dig too. It's very delicious. Then there's the very tasty macaroni tahdig. A fantastic combination of crispy noodles, fresh tomatoes, and flavorful meat sauce. In a large bowl wash the rice with cool water a few times to get rid of the extra starch. Soak the rice in 8 cups of cool water, add 4 tablespoons of salt and set aside for at least an hour. In a large non-stick pot that has a tight fitting lid, bring 8 cups of water to a rapid boil on medium-high heat. Drain the soaked rice and pour into the boiling water. Bring the water back to a boil on medium-high heat for about 7 minutes or until the grains are long soft on the outside and hard in the center. Drain the rice in a fine mesh strainer and rinse with cool water a few times. Wash the rice pot and return to heat. Add 2 tablespoons of vegetable oil, 2 tablespoons butter and 1 tablespoon of liquid saffron to the bottom of the pot, move the pan in a circular motion or use a wooden spoon to evenly cover the bottom with oil. Remove from heat and with a large spatula return the parboiled rice back into the pot, building it into a pyramid shape away from the sides of the pot. In order to release the steam make 4-5 holes in the rice with the handle of the wooden spatula. Place the pot back on the stove on medium heat, uncovered. Wait about 7 minutes or until steam starts coming out of the pot. Gently pour 2 tablespoons oil, 1/4 cup water and a tablespoon of saffron over the rice, cover, lower the heat to medium-low and steam the rice for 45-50 minutes. It is very customary to cover the lid with a kitchen towel or 2-3 layers of thick paper towels to prevent the moisture from going back in the pot. Nowadays, there are fabric lid coverings especially made for this purpose in Iran. 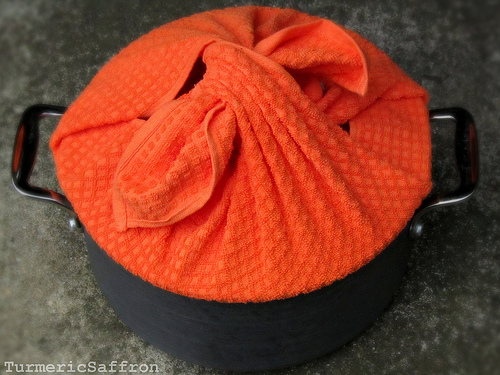 I do recommend using it for making a perfect tahdig. To serve tahdig first serve the rice on a platter. Gently mix some of the rice with the dissolved saffron and arrange it nicely on top. 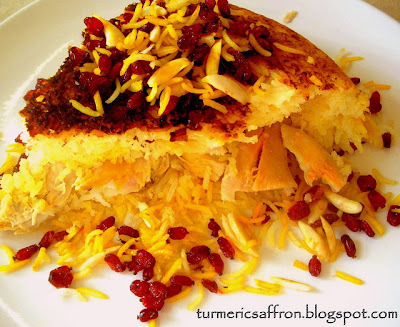 Remove the tahdig with a spatula and cut into small pieces. 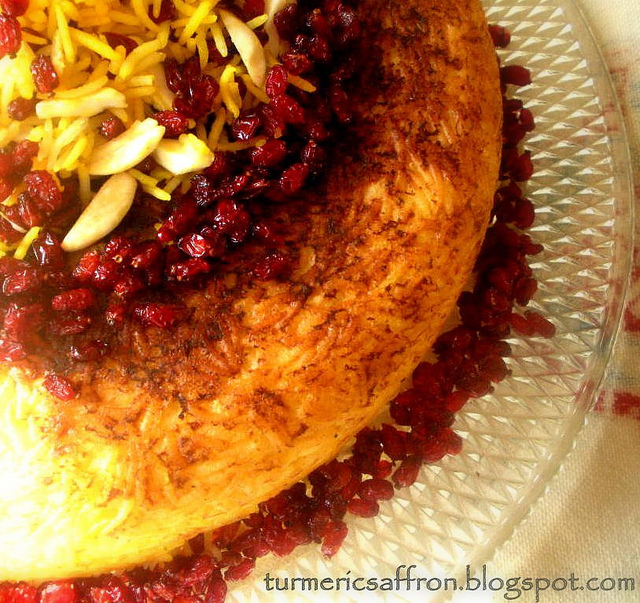 The only problem or drawback is that there is usually not enough tahdig to go around. Being the fifth kid out of six children, I know how that feels growing up, fighting over the last piece of tahdig on the dinner table. That's called preparation for life!